Home > Law Books > Treatises > Foreign Accounts Compliance, 2018 ed. 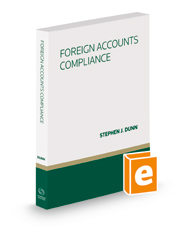 Foreign Accounts Compliance, 2018 ed. The Internal Revenue Service (IRS), at the behest of Congress, has in recent years been endeavoring to discover U.S. taxpayers' noncompliant foreign accounts. Such taxpayers face draconian civil penalties and even criminal prosecution if the IRS discovers such financial accounts before they are voluntarily disclosed to the IRS. Foreign Accounts Compliance fills a void of published authority on U.S. taxpayers' foreign financial accounts. Guidance to deal with the tax compliance needs of immigrants – educated professionals who left financial accounts in their native country, or inherited accounts there after immigrating to the U.S. Compliance with U.S. law concerning foreign financial accounts is a booming, lucrative practice area. U.S. taxpayers face unrelenting efforts by the IRS to discover their foreign financial accounts, civil penalties and even criminal prosecution if the IRS discovers their foreign financial accounts before they are voluntarily disclosed to the IRS.